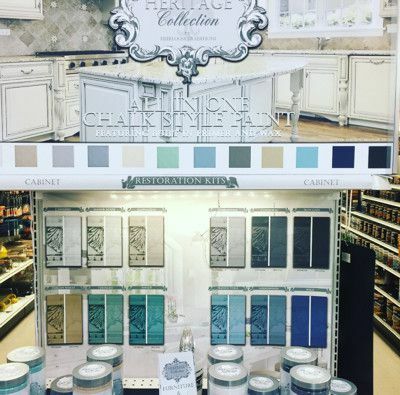 The new All-in-One chalk-style paint from Heirloom Traditions make refinishing cabinets, furniture, and accessories easier than ever before. Typically with a chalk style paint, you will need to prep a surface with a primer and then apply several coats of chalk (no luster) paint and then follow it up with a wax that seals and protects the chalk paint. With the Heritage Collection All-in-One chalk paint, there is no sanding, no stripping, no primer, and no wax! All in One chalk paint has a built in bonding primer that bonds to slick surfaces, such as veneer. The built in wax allows the paint to dry to a smooth, velvety finish that provides that quintessential chalk look! The built-in top coat provides extreme durability once once cured for long-lasting results, which is always a good idea when refinishing furniture and cabinets that are in high use. The only prep that needs to be done is to make sure that the surfaces you are to paint are clean and dry. You can use a mild degreaser to assist with that. Then apply 1 coat of chalk paint, allow it to dry (1-2 hours) and then apply a second coat. The paint has self-leveling properties that will help eliminate brush strokes and provide a beautiful flat, matte finish! If you wish to add some "age" to the look, simply use a damp cloth to remove some of the finish around the edges, and/or apply their weathering gel to darken the detailed areas. The Heritage Collection is available in 12 colors. Stop by our Paint Department to see them in person.